If you read my review for Daughter of the Forest, you’ll know that I have a very special relationship to Juliet Marillier’s Sevenwaters series. 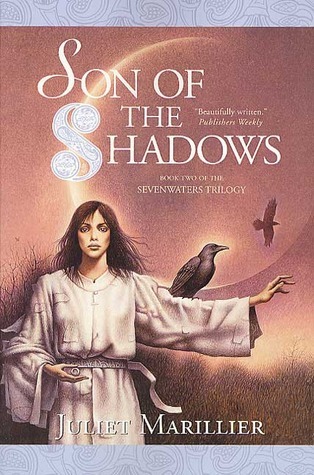 Every year, I try to reread some of the Sevenwaters novels and this year, I started with Son of the Shadows. This second installment of the series follows Liadan–the daughter of Sorcha and Red. Liadan is both similar and different than her mother. Like Sorcha she loves the hearth and home and knows the importance of family. But unlike her mother, Liadan makes some decisions that challenge the wills of the Tuatha De. Beautiful Sorcha is the courageous young woman who risked all to save her family from a wicked curse and whose love shattered generations of hate and bridged two cultures. It is from her sacrifice that Sorcha’s brothers were brought home to their ancestral fortress Sevenwaters, and her life has known much joy. But not all the brothers were able to fully escape the spell that transformed them into swans, and it is left to Sorcha’s daughter Liadan to help fulfill the destiny of the Sevenwaters clan. Beloved child and dutiful daughter, Liadan embarks on a journey that shows her just how hard-won was the peace that she has known all her life. Liadan will need all of her courage to help save her family, for there are dark forces and ancient powers conspiring to destroy this family’s peace–and their world. And she will need all of her strength to stand up to those she loves best, for in the finding of her own true love, Liadan’s course may doom them all . . . or be their salvation. Though Daughter of the Forest will always remain my absolute favorite book EVER, Son of the Shadows is a very, VERY close second. I adore Liadan. I felt that I could very closely relate to her character, though she and I are in such vastly different life circumstances. I adore Marillier’s prose and lyrical descriptions. I love the way this masterful author can weave a world that feels so real despite the presence of magic and impossible beings. As with all Marillier’s works, I feel myself drawn to the divine and to the peace that can be found in relationship and nature. Every single sentence in this book is a masterful work of art. If you’d like to read Son of the Shadows or any of the other Sevenwaters books, click the links below! You know I’m not gonna spoil a book for you guys! You can look elsewhere for that! ← The Dark Ship Ebook Winner Announced + More Giveaways!